The weather was sunny and warm for the Sunday running of the Tour du Lac Brome, the Knowlton road race, which enjoyed a great turn-out for the 2006 edition of the 20km, 10km, 5 km and 1.6 km races around Brome Lake and the town of Knowlton. 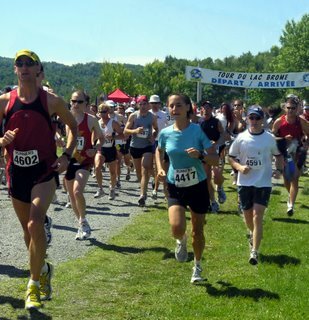 In previous years the number of runners has been around 250 and the perfect conditions brought out large crowds from all over the Eastern Townships to take part in this very popular local marathon. The parking lot at the Brome Duck Farm was filled to capacity and crowds gathered early to get the best place ti pitch a few lawn chairs and hide a cooler in the shade of the trees to enjoy the race. The Lions Park is the traditional start and finish line of the race. The 20 km race started first with runners taking off at around 10:45 for a loop around Brome Lake and through Knowlton. The elite group of racers usually finish the 20 km loop in just over an hour and the heat and strong beaming sun this year may have had some effect on the results. Crowds along Victoria street taking part in garage sales cheered as the first runners began heading for the finish line giving the extra moral support for the sweating joggers who were brave enough to run 20km on a Sunday after a Saint Jean night of celebration. The cheering was inturrupted a couple of times by the sirens of the First Responders heading out to an accident that occured on the course. Details were not released but the later races were delayed because of the incident during the one leg of the race. After the race a the runners had a picnic in the Lions Park, relaxing with a souvlaki and mixture of salads or enjoying a frosty beer to help ease the cramp leg muscles and sore calves. The park was full of family and friends of runners and just supporters of this ever popular race. The park was full of new faces as many of the participants come to Knowlton from all over Quebec to participate in this well known event. No doubt the runners enjoy visiting Knowlton and after the race the downtown area was filled with tourists enjoying the shopping in Knowlton and sitting on the terrases of the local restaurants enjoying the sounds and smells of a beautiful summer day. Of course, as far as racing 20km goes, or even running a 1.6 km race I must say that I would really only be inclined to do so if there was a large slobbering, hungry wildact chasing me! But judging by the tattoo on this runners leg that isn't a sentiment shared by everyone. This serious runner had a tattoo of himself crossing the finish line of the Boston Marathon as well as the times and years of his performances in Montreal Marathon and other 26 km events. The Tour du Lac Brome brings out all calibre of runners from those just trying to test their limits to others who are obsessive about running and living the lifestyle of ultimate health and movement. To see more photos and the results of the race of this year and previous years visit the official Tour du Lac Brome website.